Wolverine & the X-Men #35 – Bringing it back old school! Recently the House has lavished Jason Aaron with plaudits over his delicate poise in creating a God in Thor and a Devil in Thanos. It must not be forgotten that he has also penned Wolverine and the X-Men for thirty-five issues. Once it began as a lead title with Uncanny X-Men, but since AvX and Bendis entered the X-fray, it seems to have been relegated to a second tier title. This has not stopped Aaron and Bradshaw from producing a great book that they have nurtured since the Schism divide. There are two core themes to this book that reserve its own unique place on the comic shelves; The light hearted nature of a school for X-kids and the development of their personalities and rapports. It is a coming of age comic for a host of characters, new and old, and they have a little fun whilst doing it. This comic finishes the five-part Hellfire Sage storyline, which truly began way back at its initial issue. Kade Kilgore and his motley crew are high functioning sociopaths and have taken over the Hellfire Club. In a bid to unsettle Wolverine, the young antagonist created a rival school to teach children the art of villainy. His teachers include characters than have been the bad guys throughout the title, including Dog, Starblood and Mystique. 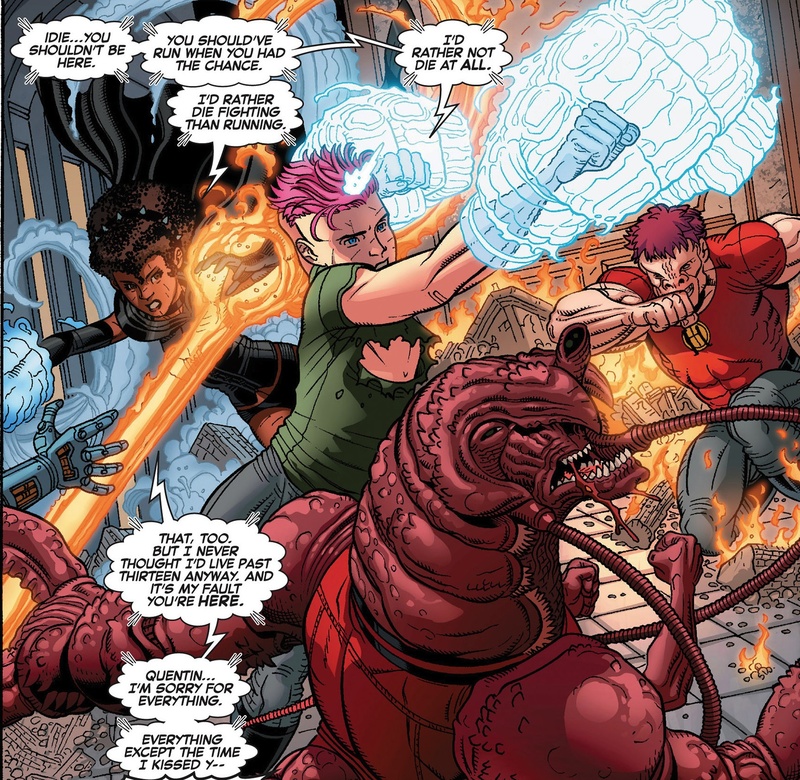 Unfortunately three key Jean Grey cadets felt the lure of the Hellfire academy: Idie, Broo and Quentin. Their motives were far from simple, for one, Broo was actually kidnapped. Kilgore had taken a shine to Idie and tried to manipulate her mind into joining his school. But it was not until Broo was shot and left for dead by Kade, that she succumbs to his proposition, with a thirst for revenge. Quentin has always had a twinkle in his eye for Idie and decides to follow suit in order to protect her, and uncover the mysteries of the school. This is where the story really becomes quite the jovial caper. Over the past five issues we have had a wonderfully satirical villainous school, which included lessons such as Subjugation through Science and Public Relations for Psychopaths. Our angsty teenage protagonists have explored the halls, eaten fruit gummis and energy drinks in the canteen, bullied a student called Snot, and watched Doop’s home movies from 1994. The creators are really enjoying themselves and even drop in subtle moments of self-deprecation such as Quire’s mocking of Raven’s teaching credentials because she was only recently killed by Wolverine, and how to seek revenge on an archenemy: stuff their loved ones into refrigerators! It is a ridiculously large cast to manage but Aaron gives them all time to grow and mature. Of course he develops on the foundations laid from very early issues and makes their personalities his own. He avoids using the regular cast as a main focus for the book because they are all featured in other x-books, and even the finale is far from the adults saving the day. The true heroes of the comic are Idie and the unlikely Quire, and even more unlikely, Toad the janitor. I think it is about time for some fresh blood. Nick Bradshaw art is a veritable companion to the atmosphere of the book. His people are drawn firmly and quirky. There is less of an approach to realism but more on the details of the defining characteristics, such as Snot’s nose, Quentin’s hair and Broo’s teeth. In fact the art is dependent on body shape and hairstyle to delineate its characters and distinguish their age. 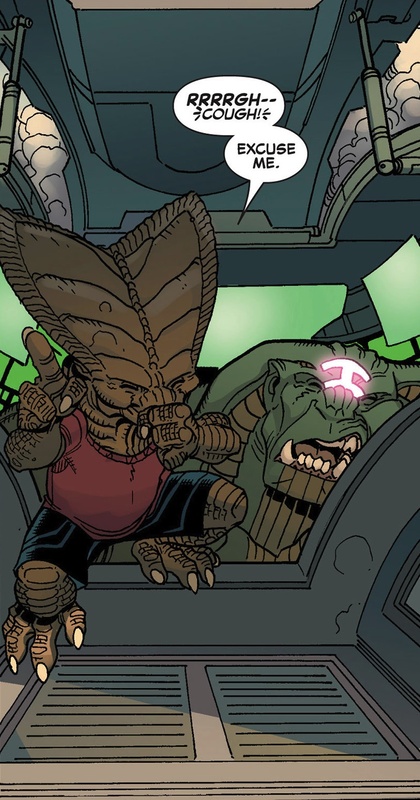 It is obvious Bradshaw is enjoying drawing the variety in cast members, as he provides and immense amount of detail to the giant Krakoan monsters and Iceman’s Voltron/Transformer avatar. The colouring is daring and bright as you may expect from the tone of the book but it fits with the pencilling and inking. It is a suitable accompaniment to Aaron’s cheerful jaunty side but sometimes fails to really bring out the emotion when it is needed. It plays out the classic cliché comic facies but lacks elegance when the writing demands it. This is by no means an easy task and I rarely see it executed successfully. For those that are failing to enjoy the quirkiness and oddities of the Hellfire misfits, there is an undercurrent of teenage emotional confusion and unrequited love. Quentin Quire has been a continual thorn in Wolverine’s side and we finally see him mature into a true X-man. His personal journey was borne out of a semblance of duty but more truthfully from affection for Idie. Her shame at betraying her fellow students and blame for the demise of Broo, took her on an ill-fated mission to the Academy. It was here that both these characters took on the Hellfire Club, and succeeded in not only burning down the school, but also overcoming their own insecurities and developing feelings for those around them. The romance of Quentin and Idie, all of a sudden, seems like the most natural relationship. This plays a beautiful parallel with Toad who is enticed by Husk’s love, only to find himself manipulated and betrayed. His protestations of love fall on the deaf husk ears of Paige. The lonesome outcast becomes the unlikely hero when he comes to the aid of Quentin, but it is his refusal to give up on the woman he loves that makes him amazing. He holds onto her and keeps tearing off her husks, in a bid to find the kind-hearted woman he fell in love with. And if that wasn’t enough, we then have Broo….. I genuinely believe that Wolverine and the X-Men is borne from the spirit of the classic X-Men school stories of old. Uncanny and All New X-Men features incredible amounts of untempered posturing and boring teenage angst. They lack the love and humour of an X-school, which made the old X teams so vibrant and exciting. This may be aged rhetoric and nostalgia but I miss those moments. 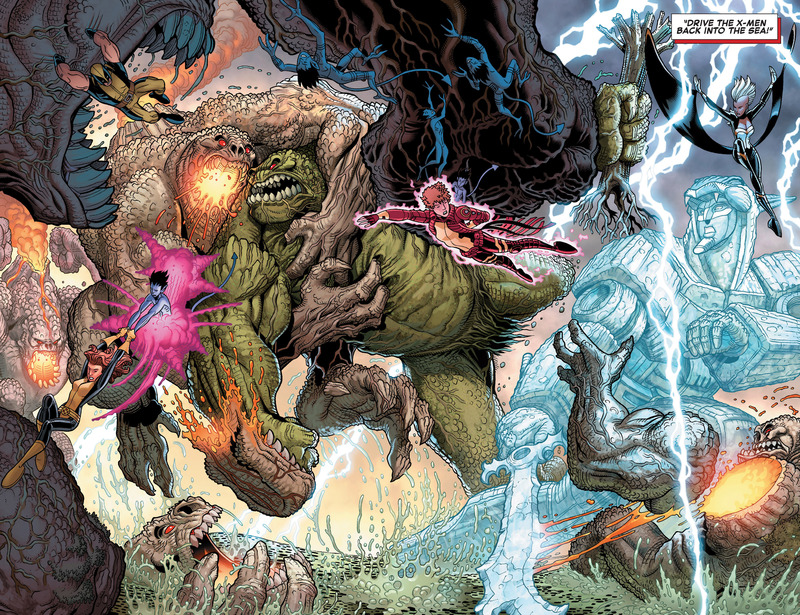 Jason Aaron has created a new team of gifted youngsters almost from scratch and he has made me care for them. As if all this wasn’t enough, the saga ends with a brilliant hint at the return of a beloved character. Next PostThe Theatre List 28/8 – Mind the….What?! Just started on this title on a recommendation…and for the return of that beloved character you spoke of! Nice review man!